Adding fish to your pond provides a whole new element to the overall experience of owning a water feature. In fact, many pond owners decided to install a pond for the sole purpose of fish-keeping. 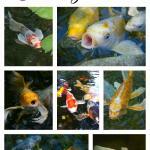 Will you add some colorful koi, or opt for another type of pond fish like shubunkins or sarassas? When purchasing new fish, there are certain things that you should look for and ask about to make sure that you are receiving healthy fish. Cleanliness – Look at the cleanliness of the store. If the store is not clean and well cared for, more than likely, the retailer does not care about their fish either. Dead Fish – If you see any dead fish floating in the tanks – even just one – stay away. This can be an indication of a poorly maintained, diseased tank. Quarantine – Does the retailer quarantine their fish and for how long? It is very important that all fish are quarantined for at least 14 to 21 days for salt treatments to ensure the fish are not carriers of disease or parasites. Water Testing and Changes– Find out how often the water is tested and changed. Testing the water monitors ammonia and pH levels, as well as nitrites and nitrates indicating when the water should be changed. Sick Fish – Look to see if any of the fish are hanging out alone, with clamped fins. This is a good sign that the fish is sick. Parasites – Ask if new fish are tested for the presence of parasites with a microscope. Doing so indicates whether the fish are carriers of parasites and can be treated accordingly before they are sold. Net Sharing – Make sure the clerk uses a different net for each tank. Using the same net for all tanks can spread disease from one tank to another. Clear Skin – Look for fish with no marks, missing scales, sores, or broken or missing fins. Any of these are signs of a bacterial infection or parasite. Sizes – You need to take the size of the fish into consideration so you don’t overstock your pond. Remember, 1” for every square foot of surface water or five gallons. Knowledgeable Staff – You want to purchase fish from a knowledgeable and honest merchant that can help educate you about your pond pets. Whatever type fish you choose to add to your pond, first and foremost you want to make sure they’re healthy. Don’t be shy about asking a few questions. In the end, you’ll be glad you took the time to purchase the right fish for your pond. For more information on backyard fish ponds, get in touch with our experts at Aquascape Supplies Australia - Australia and New Zealand's source for pond equipment and accessories, including pond liners, pond lights, pond pumps and more.